What have been looking for in the adventure touring segment, then? To me, the first thing is a bike that feels like India had no hope of breaking it. An utterly, completely indestructible thing. The next is a reasonable spec at a great price. And finally a sense that all your dreams of touring out in the open are now just the push of a starter button away. 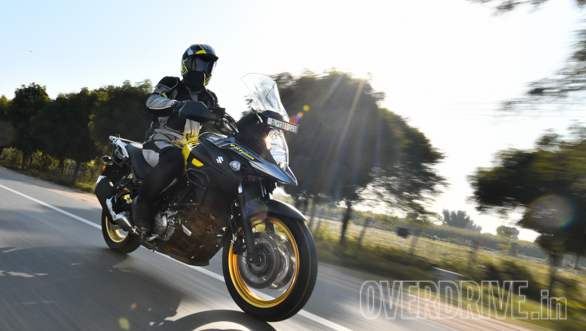 Welcome to the V-Strom 650 XT ABS. This should be a mild-mannered 650cc twin. But oh my god, it's so much more than that. 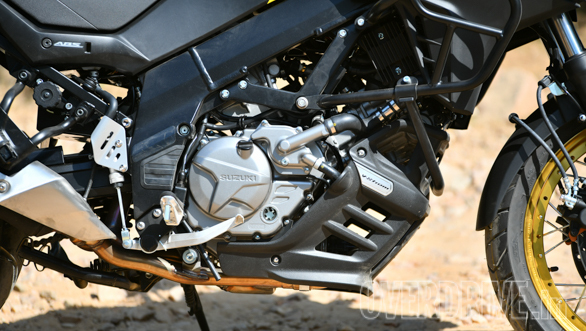 The V-Strom engine has humble origins. It's a fairly basic 90° V-twin that already does duty on various Suzuki 650s, including the well-liked SV650 (hint, Suzuki). On the 2018 model, there has been some retuning but the essentials remain the same. The fuel injection system used SDTV, or dual throttle bodies to smooth out the arrival of power. Suzuki also has an electronic boost at low revs that smooths out riding and helps new riders. This is a smooth, fast motor that feels collected and composed. Like all its parts work together as an awesome team. Power arrives easily at 2,500rpm and I was able to pull smoothly from 40kmph to somewhere north of 180 in sixth gear. And when I was done with that, the motor remained smooth and torquey at almost any speed I chose. The wide torque spread also means you can easily run a high gear and not change up and a down a lot even in traffic. The slick if muted growl and the lack of vibration in the bars, pegs or the seat make this a rather likeable motorcycle. When you notice how easily it gathers speed, you cannot help but develop a rather large soft spot for the Suzuki. The gearbox and gearing work rather well. And one of the 'flaws' is that the gearbox can feel peculiar on downchanges. It feels like the lever is moving through loose, gravelly soil although upshifts are smooth and I never ever missed a gear. The engine is housed in a fairly basic frame too. You gave an old-school twin-spar frame with non-adjustable front forks and a rear shock with a remote preload adjuster. 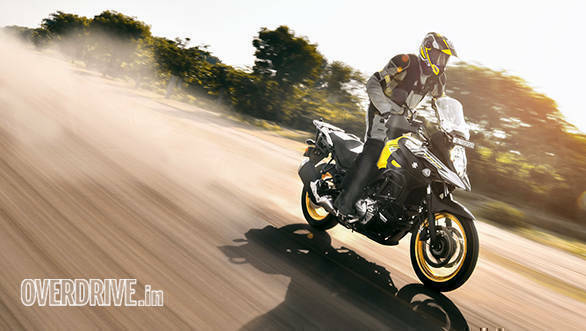 The V-Strom gets dual-channel ABS as standard with its 310mm twin front discs and the 260mm rear disc. Suzuki continues to surprise us by offering extremely slick traction control even on smaller bikes like this. 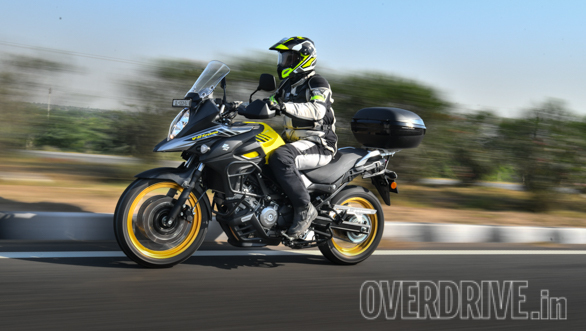 The V-Strom has two modes, 1 is for sporty riding and accepts some wheel spin or slip. 2 is for wet or slippery conditions. And you can turn it off, though there isn't a way to turn off ABS at all. One of the highlights of the XT model is that sets itself up as a credible off-road capable tour-enduro with its 19" front wheel. 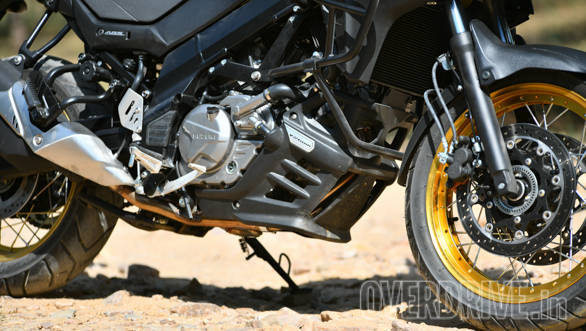 The XT spec uses tubeless spoke rims - I look at the Tiger 800 XCx and wonder why that motorcycle, almost twice the price doesn't merit this. This means the Bridgestone Battlax Adventure big block tread tyres are properly tubeless. Which means less of a headache when you have a puncture. Suzuki India says the demand for spoke rims - for this exact reason - was a near constant in their initial surveys. On the road, each element adds up. I wouldn't call the V-Strom a very large motorcycle in physical dimension. This makes it easy to hop on and get on with riding. Handling is a clean package. It turns quickly enough, is extremely stable at lean angles and never seems to do anything to upset you. That's perfect for the sort of rider who's going to be buying these here. I do suspect that a slightly softer ride, especially at the front would be more useful in our conditions. 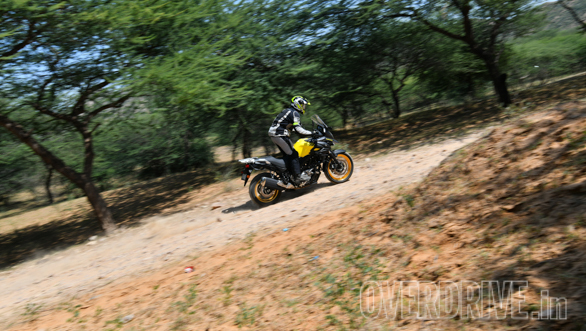 But the V-Strom takes big potholes and irregularities in its stride and doesn't make you too uncomfortable. The stock saddle is a bit stiff and that's a bit of a question mark. I like them because they settle in after a few thousand kilometres and then they're great for hours. But I know many of you prefer significantly softer saddles. The brakes are lovely. They come on with a strong, well-judged bite and they're very easy to modulate. You can sometimes feel like hard, sudden braking can cause the front forks to 'fight' weight transfer creating an odd sensation. But this is an easy, predictable motorcycle on every count. We didn't get too much of an opportunity to bash the V-Strom off-road but we did go and hit a trail on the outskirts of Ajmer for a bit. 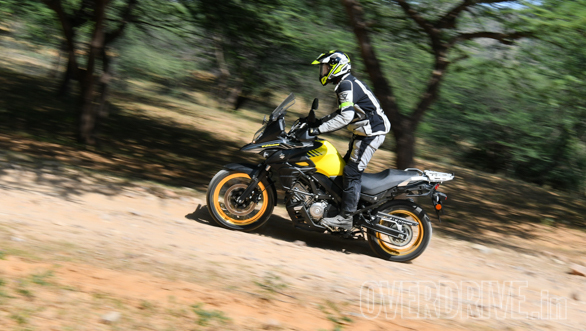 The V-Strom is a bit jittery at low speeds - my usual pace off-road. But once you find the confidence to crank it up, the stiff ride quality becomes quite absorbent and the grip, behaviour and your ability to lock on to and control the bike standing up are all excellent. For touring, again, I think the V-Strom is rather well tuned for our conditions. 80kmph to 130kmph is extremely smooth, and from the digital readout, quite fuel efficient too. With a 20l tank, I think a realistic 360-380km on a well-ridden tankful should be possible and I think that's more than enough. 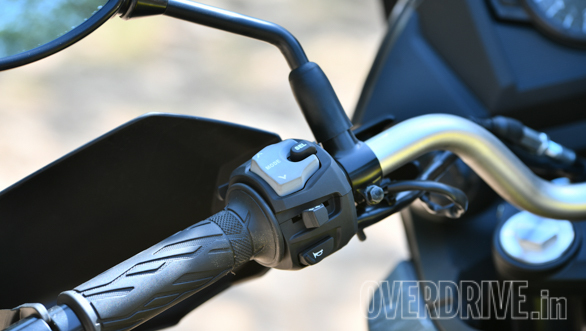 The V-Strom has a three-position adjustable screen. But the tall position didn't work for my peaked helmet - your mileage may vary. Adjusting the screen requires an allen key - that's annoying. 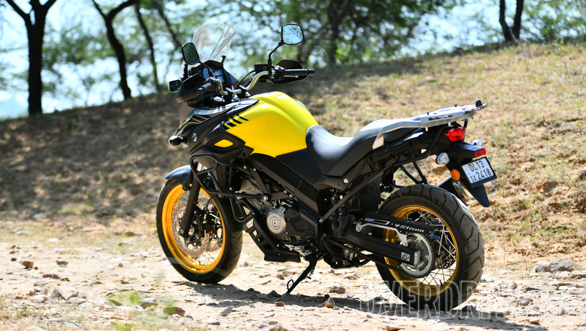 Suzuki will be selling panniers as well as a large top box for the 650 in India. This is a solid package! Clearly, there are more reasons to buy the V-Strom than to not buy it. 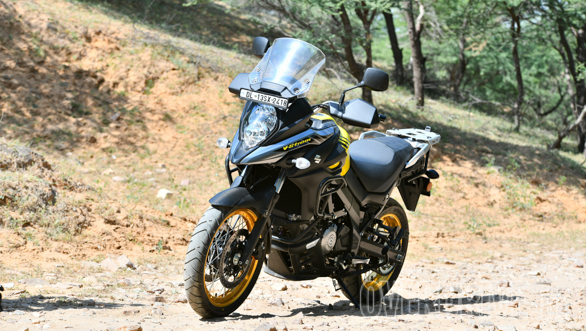 At Rs 7.45 lakh, the V-Strom is Rs 76,000 more than the Kawasaki Versys 650. 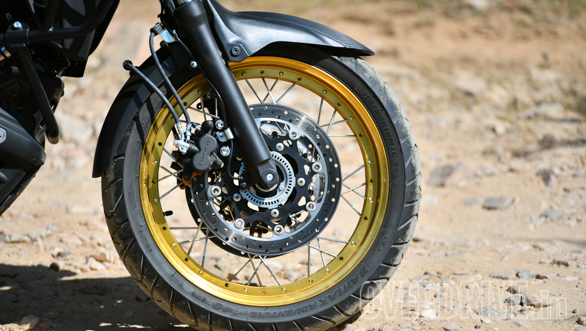 The Kawasaki has vastly superior suspension for the road but with dual 17" wheels, it's meant to be a road-going tourer. In comparison, the Suzuki is more expensive but clearly a lot more value. The 19-17 wheel combination is matched to good on-off-road rubber as well as tubeless spoke rims. The Suzuki also gets traction control, a smidge more torque and power. In fact, I'd go so far as to say that this might be the ultimate, affordable mid-displacement adventure tourer for India. But the reason to pick the Suzuki, outside of all these considerations is a simple one. No matter how hard I rode it, through whatever potholes and rocks I failed to avoid, it felt solid. Solid like the rocks it went over. Solid like a bike that would never stop chasing the horizon. That's always a good reason to get a bike, no?